You folks were a DREAM come true! Your performances of Insect Songs provided the focus of the day and helped make Copia Kids Garden an unqualified success. With the deepest regards, a big THANK YOU for your wonderful performances. You were absolutely terrific in your show Friday night. Did you hear how the kids loved the Green Grasshopper video? We love our Insect Songs CD and so do all of John's friends, but now I'll take off my objective journalist's hat and tell you I really love your new CD. We still love Insect Songs, but there maybe a few more hits on Sealife Songs. I'm not sure - but it's awfully good! You guys are super talented and a delight to children - which is just the most important thing in the world. I just wanted to say Thank You so... much for coming to us this summer! The kids just love it when you're here! We had quite a mixed age group yesterday and they all really enjoyed! You are always top-notch! On behalf of Husky House staff and kids...thanks again for such a great time! We VERY much enjoyed having you at our Earth Day event at the Aquarium  our audience (and all the exhibitors) loved your shows. Thank you very much for your enthusiasm. Thank you for such a great day with my children. We were at your San Ramon concert and now my children can't stop singing your songs and marching like ants! Both my girls were caught dancing and hopping on camera on the Evening Magazine segment and now they think they're stars (-: I am an early childhood educator and I am always looking for great new music and events. We are now huge Sandi & Stevie fans and have both your CDs. We play them all the time - but we can't get enough bug fun - so we hope to see you again soon! I just wanted to thank you for the awesome, fantastic performance the other day at Vintage Parkway. That was, by far, the most entertaining assembly this year - it was so enjoyable and entertaining. During so many of the assemblies, kids are bugging us (no pun intended) to go to the bathroom but everyone was so engaged during your show that no-one bugged us. It was interactive, humorous and informative - we all loved it. On behalf of the kindergarten and 1st grade teachers at Vintage Parkway... Thank You! Thank you for putting on such a great show. The children and parents (and I) enjoyed it very much. I love the way you include the informational and the fun stuff. Next time I see a bug in my house I will scoop it up and set it free. Well, to be honest, my husband will do it! I wanted to let you know that we really loved your show; the kids had such a great time. We'll definitely have you guys back when the opportunity arises, and I'll happily recommend you to anyone who needs some entertainers for children. Thanks so much for a wonderful show! My daughters (5 & 2 years) and I attended your concert at the Dougherty Station Community Center in San Ramon a couple of weeks ago. My two year old has not stopped talking about Stevie since we left the performance! And she is always singing Green Grasshopper! Our CDs arrived safely and we look forward to reliving your concert in our own family room! We will definitely be keeping our eyes open for other performances that you will be putting on in the future! Thanks for a great time! We loved your show and hope to see you again soon. My 2 ½ year old loves you guys and fell in love with you at the Dougherty concert, Stevie! Green Grasshopper! I can't get it out of my mind. I have heard nothing but fabulous reviews about your show and not one teeny-tiny negative. You know, parents can be critical - and they loved you! It was such a great night - so I thank you. I thought I’d call you and tell you personally. Thank you very much! You did a great job and you are popular with us. The children loved the show last Friday, and they have always loved the Insect Songs - it's our favorite CD at Teddy Bears. I play it every day for class time and also during free times. The kids know the numbers of the songs and most of the words and sounds. We sing and dance along - and best of all, the kids have a blast listening to it. Thank you - see you soon. The children once again loved your show. We want you next summer when we talk about the ocean... and again, the show was FANTASTIC. Hi You Guys! Thanks for putting on such a fun program. Everybody had a wonderful time… See you again. I brought my kids (2 and 4 years old) to see you when you had your Insect Songs show in San Ramon and then at the Pittsburg library. We bought both your CDs and the kids love them. I was not sure they would enjoy the sea life song, since they hadn't seen you perform that one, but they love it too. Even adults like to hear it. Very calming. Good job guys! Thank you for your wonderful performance. The children and parents enjoyed it tremendously! Thank you so much for being here at Tully Library. Our customers experienced an extreme marvelous time! Thank YOU for the show! It was fun for me, and the kids and parents really enjoyed it as well. I really liked the way you got the children participating, and up and moving! Thank you both for a wonderful show, everyone here is still talking about it!. Thank you, once again, for spending time with our children. They truly love your show. We are looking forward to many more years. You just never know when a 3 year old is going to be impressed - my daughter, April, and I came to your concert at Crow Canyon Gardens. We loved the show and sang most of the songs on the way home. But, what April remembers most was Stevie's bit about how funny the words "Habitat" and "Magenta" are. She makes me go through the routine at least once a day. I'm not sure it's a good thing, but it makes her laugh so hard she gets the hiccups. I met you after your Insect Songs concert at Thornhill school. I was impressed with your creativity and sheer performing gusto. I always admire people who, like Mr. Rogers, interact and play with children without patronizing them. I can see you both have devoted yourselves to producing original songs. My applause. Having heard you both bzzz and whzzz, I can see how the combination of Welsh musical sensibility & Sandi's voice lead to very sweet songs. I liked the bug show at Fairyland. I didn't actually like it - I LOVED it. We're coming to the Zoo to see you and we want to hear the ocean songs. I don't know what the ocean songs are but I know what the bug songs are. Whoa, this takes a lot of letters. Love, Lexy (typed by her mom Effie who likes you guys too). Thank you so much for the wonderful show at Sima's party. Everyone loved it. You are awesome! Sima and I also enjoyed your show at Fairyland a lot - as we always do. Sima loves the Sealife Songs - she already has her new favorites figured out. Yours, Sima, Rina, Lev, Vera & all of Sima's friends. I wanted to say thank you both so much for making Amanda's 5th birthday so special. The kids all had a great time. Also, thank you for being so accomodating to our schedule. Keep up the great job you are doing... entertaining our children. 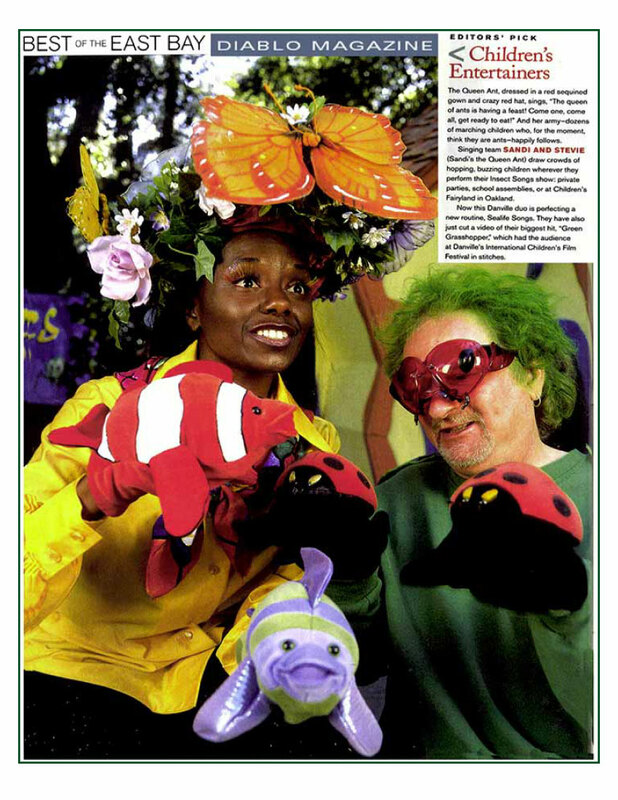 I was working at Children's World Day Care this summer when you guys performed the Bug show for us. I was really impressed and loved the music and everything. I came across someone who had your CD. I would really like to have one - how I can order it. Thanks! My daughter, Sonya, has seen you many times at Fairyland and LHS. And we eagerly anticipate your new CD as we are fearful we are wearing out our Insect Songs. We will be hosting about 15 children at a picnic in Tilden Park and if you can fit us into your schedule it will make the party. Thank you for such a fun performance at the Veteran's Hall. Tayler and Julian were so excited to see you and were so happy to hear all their favorite songs. Your CDs are wonderful! My kids love the songs and have learned the words already. Jourdan, well, he won't admit to liking kids songs, but when his friends aren't around, he sings along too :) We played them on our long weekend to the snow and we play them on our way to school every day. We listened to the Sealife Songs this morning for the second time and I really, really like this CD. Thank you both for making such wonderful children's songs. How 'bout a Wild Animal CD next? Thank you so much for the wonderful performance of Sealife Songs at Ariana's party. All the kids had a really fun time (so did the grown ups). Ariana loved the dolphin song and the dancing the best. Maija liked sending Stevie "back to school". She liked how funny and silly he was. It's always great to see you both! We watched your performance at Whole Foods yesterday. GREAT performance. My daughter, Sara-Meilin, liked it so much (you may remember her - she was the little girl who just HAD to watch both of you pack your equipment and props into your car) that she wants to have you both perform at her next birthday party. Thank you so much for making my birthday party so much fun! You're both so talented and I am forever grateful to you for yor wonderful show! Everyone had a great time. Also, thank you for the CD - I've been listening to it every day. You performed at my son's pre-school in San Ramon - he absolutely loved you and has not stopped talking about your performance. We saw you in the 4th of July parade in Danville and getting your CDs went on my to-do list. Ben is doing all the dances - thanks for the fun! Jenna had a great time at your Sealife Songs show - she stayed to see it twice. I really enjoyed it too. We love listening to the CD, love it! I just want to thank both of you for such a WONDERFUL party! Autumn is still talking about it and I saw some of the kids today and they told me they had a LOT of fun. Thanks again! Thank you for coming to my party. I love your bug show. Love Sami. My son, Noah, attends Forest Hill Preschool and was present at your Sealife Songs show there. He loved it! He really wants to wants to see you again - will you be performing any public shows soon? We received the Sealife Songs CD and Noah loves it. Thanks so much! Thanks a million for a great show - you really made Denna's birthday. You guys were so fabulous and you're so talented. We were listening to your beautiful CD today - when the songs ended Denna would say "again, again", repeatedly. I think you really need to market yourselves in a big bad way. P.S. You can use us for a reference anytime you wish. Hi there! We had so much fun yesterday at Children's Fairyland and we just love your music :-). We have enjoyed listening to the Sealife and Insect Songs CDs. Your music is so cute and enjoyable. I have already told everyone about you at work. Thank you for personalizing the music using Bob - that was too funny. Anytime you can make him blush is time well spent - take care! I had the pleasure of being at Discoveryland Preschool the other day when you performed your Insect Songs (and let me tell you - I've still got that Green Grasshopper song in my head - it's catchy!) You're well known and loved with the Discoveryland set and we know that a bug party would be something parents would really treasure! Are you available to perform for my daughter's 3rd birthday. She absolutely loves your Insect Songs CD and can sing all the words to Dragonfly by heart. It would be a thrill for Hannah to meet you and hear you sing her favorite songs in person. I'm attaching a picture of her in hopes that you will say yes :). We had great fun seeing you guys - congratulations on your glowing reviews and coverage in Diablo Magazine - it's well deserved. Remember us little folk when you get so big that they'll be making Sandi & Stevie dolls! Thanks for the great party on Sunday! I was so pleased with how it went, but I'm sorry that you got attacked by some of the kids! Did you get all your butterflies back? The children and parents had a great time. Thanks! My son goes to Crow Canyon Day Camp and you did a show there. It was so much fun. My children's names are Jethro & Josiah and I'll tell you, they really love your Insect Songs CD and me, too. More Power. The Insect Songs stirred my niece and nephew’s little hands and feet into ecstacy! I’m not kidding! When I put on the bug CD they ran into the living room and started to laugh, sing and dance - bzzz! bzzz! hop! hop! I was amazed to see them enjoy so much. It was so much fun that I joined in the action. When Marching Ants came on we all marched around the house - this was Christian’s favorite. Cassandra was tickled with Sandra the Spider. They kept asking me, what’s next? what’s next? We all LOVED it! We played the CD THREE TIMES! The 2nd time, they were so quiet listening to Insects Prelude, but when Five Little Insect Friends came on they exploded into action! It’s really thoughtful how the songs are organized - with the soothing songs at the end to calm things down - I really needed it! Sandi’s voice is so lovely and relaxing. You are geniuses! You’ve created such a wonderful cast of characters. We are all looking forward to your next CD. Your Insect Songs CD is a great hit with all three of us - and with our baby sitter! It's been played almost non-stop all day. Christopher has most of the words memorized already and Alex knows exactly when to say the catch phrases and when to hop! hop! hop! It is so special and wonderful to hear your voices filling our home. The CD is very well loved and very well worn already! It’s played every single night in either Alex’s or Christopher’s bedroom. Since it’s the only thing they want to listen to, I ration them to two nights each before it changes rooms! It’s a smash hit in this house! WE LOVE YOUR MUSIC! The Grade 4's who listened and sang your songs were absolutely thrilled! They especially loved the roach song! They decided to dress up in Mexican ponchos and sombreros, adding huge black antennae before performing the song. They added actions - and then the parents and children went home singing your songs! The Insect Songs CD arrived. My kinder-2nd graders love it. They are already trying to decide which bugs they want to be for the spring program. They really love the Itchy Itchy Dance - that's #1. Their 2nd favorite is the Marching Ants followed by the Greedy Wasp and Five Little Insect Friends. I love the Insect Songs. I can’t wait for my nephews to hear it. You sound wonderful. The songs are pure and witty, appealing and never condescending - isn’t that the key to writing for kids? Hearing children’s voices at the beginning, talking about insects and using the word “free” in some context, is particularly sweet and touching - it gets a child’s attention straight away! I especially LOVE the lyrics and the artwork - the CD calls out for an accompanying book for as I listen to the songs I can visualize each character. What beautiful work! I just wanted to tell you guys how much we all enjoyed the show. It was great to see you perform. I play the Insect Songs every morning for Zoe. She loves it - especially the ant & the flea - but she goes crazy over the Green Grasshopper song - she sings it every morning on her way to school. I have to play it over and over. She loves all the songs - but she knows all the words to that one. This week she’s stuck on Sandra the Spider and loves the part at the end where Stevie says “I’m out of here”. The songs are too cute - we never get sick of them! My son, Owen, popped Insect Songs into the car and he instantly fell in love with the music. He was really young at the last two shows we went to. When we picked up my daughter Emma, she instantly shouted, "I LOVE THESE GUYS!!". You should have seen their faces when I told them that you know their daddy! Today Emma walked in as I was reading your email, and I said to her, "Remember how I told you that Stevie & Sandi know Daddy? Well look, here's an email from them checking on Daddy!" Always the drama queen, she pretended to faint on my shoulder - you obviously made quite the impact! THANK YOU, for all the smiles that are directly related to your music. I can't tell you how many times I've done the Itchy Dance while driving down the road! Your Insect Songs CD arrived - we've had a wonderful time with it. I am a music teacher and performer in the Boston area. Your CD has helped educate the children on insects and has played a big part in our daily listening station. Thanks! My children listen to your Insect Songs CD all the time when we're in the car - and that's a lot! One of their friends was in our car while we were playing it and he specifically asked for it for his birthday. Keep up the good work! Thank you both again for such a wonderful show. My kids are still talking about it and they are still reliving it. My little guy, Colin, has not stopped listening to the Insect Songs CD - it has been on loop all day! He is in the other room listening to it now. I am really enjoying it, too. The music is beautiful and the singing is superb (and I listen to a lot of children's music!!) Believe me, this is refreshing! Annie (2) and Molly (4) of Portland absolutely adored the Insect Songs CD. Their parents report that they played it non-stop for two days while marching around the house as ants and ladybugs etc. It was a great big hit! A hope to move to 1st grade next year, so I can use more of your songs or perhaps set up a concert. Nevertheless, 4th and 5th grades love when I put on your CD, especially the Itchy Flea Dance. They love when they get to move and jump around. They laugh so hard when they do it ( me too!). Received your Insect Songs CD a couple weeks ago and my children are enjoying it greatly. Even I like your songs - it's become a staple for breakfast alongside pancakes and toast. I will be ordering more in the future as gifts to my neices and nephews. Hope you produce more songs like this. My children love all the songs on the demo you sent our preschool. It's time to buy the album - we've scratched the demo and the kids can't go a day without Green Grasshopper! They just ask for it by saying ‘I want to hop’. I can't remember the title of the last song, but one of our younger toddlers dances like a ballerina to it and now all the other children have picked up on his moves. Thanks for putting out a CD that is different and can get you up and moving and singing about cockroaches! The theme of our Spring Musical is bugs. We (3 classes) are singing the Five Little Insect Friends song. The teachers made wrist bands with leaves on them and are using props (hand puppets, finger puppets, bugs on a stick, etc.) for the performance. The kids love the song and are excited about the program. As a preschool teacher it is difficult to find ‘out of the ordinary’ CDs that are age appropriate, fun and engaging. Thank you for making two of them. I am anxious to order your Sealife Songs next year. I bought your Insect Songs CD a couple of years ago for my granddaughter and it is still her favorite. I keep it in the car because she asks for it every time we go anywhere. I hear you do birthday parties - sure beats Chuck E. Cheese. My son, Alex, and I saw your program in Antioch in 2005. We enjoyed the music so much I bought both CDs on the spot. A great investment - as I also had two younger children. We moved to Texas and rediscovered the CDs after settling in to our new home. Many of our children’s CDs were now too childish, so Elmo and the gang found other homes. The Sandi & Stevie CDs are among the few to make the cut. My now 6, 4 and 2 year olds love your songs. Keep up the good work and please let us know if you ever decide to take your act on the road. North Texas kids would love you! [PART:1]: My whole family loves your music SO MUCH! We caught your show in Pleasant Hill. It was very wonderful to meet both of you, and we all wish you all the very best and God's blessings in everything you do! We love all your CDs (we got all 3! ), but the Insect Songs is Blake's favorite. He always asks for "Green Grasser-hopper" first, and then he asks for "Butterfly". He sooooo loves them!! For bedtime, he often asks for "Bring Back Song" aka "My Bonnie Lies Over the Ocean." He just sings it out on the chorus!!! It is sooo wonderful!! Keep up the excellent work!!! A big fan. [PART:2]: My sister and her family are desperate to catch one of your shows. We can't wait to see you again! We all LOVE YOU! And our love grows bigger every time we hear your wonderful music! We saw you guys at Children’s Fairyland a year ago and we thought you were great! We liked your Insect Songs so much that we bought your CD. Our daughter listens to it almost all the time - and we enjoy it every time. You guys are so much fun that kids of all ages enjoy - even big people like us! My kids, husband & I are very happy to have your Insect Songs. They are very professional, beautiful music. Sandi has an unbelievable voice. These songs were obviously written with early childhood understanding and promote care of insects. Also, my kids are having fun learning English in such a creative way. Please be sure to inform us of any new CDs. Kimmy (and her friends) LOVE the Insect Songs. It’s played often in our house. Congratulations! I think you have a great big HIT. Thank you so much for the Insect Songs CD - I love it! My mother loves it too! I caught her singing along and keeping time with her feet. It's become our favorite to listen to on our drive to Kansas City. How fantabulous! You should send a copy to Rosie O’Donnell - she and her kids would love it! I hope the album gets the attention it deserves. Loved the album. Very clever and very cute. Great fun! You can NOT have it back, my friend. I like the ‘Beetles’ a lot. The CD arrived safe and sound and Nicholas is very happy with the songs! His two sisters joined in the dancing and one even ran to change into her ladybug t-shirt to join in the fray! We received the Insect Songs CD today. We absolutely love it. Sandra the Spider is our favorite! I am having a children’s play group over on Wednesday and I am going to play it for everyone. My daughter, Madeline (5), loved you both when you came to Saklan Valley School earlier this year - even her teachers told us how mesmerized she was. I look forward to having you perform at her Birthday party - what a treat! Thank you for the Insect Songs CD, my son loves it (as do I!) I am trying to learn ALL the songs, they are all so adorable. I'm not sure if I ever told you that one of my grandaughters went to sleep every night to the Insect Songs when she was little. Green Grasshopper is her favorite. She took it to school for show and tell and played it for her classmates. I'm glad you two are having a fine time making children happy. Hi! The CD is wonderful. Chloe is with her daddy today and I just heard her request the Insect Songs. She likes hearing Stevie sing - but, only in his Stevie voice. Anyway, love the songs. My 15 month old son is really enjoying your CDs. The song with the buzzing and the Itchy Dance one are big hits. I love your web site and appreciated being able to hear the songs before purchasing the CD. I am always looking for fun songs to play when our PA announcer reads the names of the opposing team's players at the beginning of games! Any songs I use need to be easy to understand and get the message out in less than two minutes. Your Fishy song worked perfectly for the Tampa Bay Rays! I personally received dozens of text messages as soon as I played it, and the Phillies received hundreds of e-mails, asking what the song was. I have had more comments on that one song than anything else I have ever played in my 11-year career as music coordinator for the Philadelphia pro teams! Thanks for my signed copy of Sealife Songs. It's really brilliant. I don't know how anyone could write and record children's songs any better than you do. Every song is tremendous. You both sound fabulous - individually and combined. Congratulations to you, and to Don too! I was introduced to your music while watching the World Series. I fell in love with the Fishy song - it's fun and beautiful. I incorporated your music into my "Birth to 3 Years Old" programs, and now you have lots of midwestern fans! My 9-month old great-niece ROCKS to the Fishy song! She was shaking a fish rattle on Christmas Eve, and I started singing the Fishy song to her rythym, and she'd laugh and dance, so I went to the car to get my CD (yeah, I know...) and we had a fish party! She bounced, shook her rattle and adored the music. Her parents were shocked at her positive reaction! Thank you - you make every day, and especially our Christmas, so delightful with your music! Jacob LOVES the Sealife Songs and I enjoy singing along. It makes him so happy and warms my heart to hear his sweet voice. Fishy Fishy Fishy is just classic. The Phillies played this song over the PA during Game 3 of the World Series while introducing the Tampa Bay Rays. Go Phillies! Isabelle LOVES the dolphin song! She has been singing it ever since we came home last night, and my friend's little boy, from the time he left the library until he went to bed, was saying "Hop, hop, hop" and hopping to go along with it! I'd say your stories and songs are a hit! Thanks again. Our 5 yr old has heard many (but not all) of the ‘Fishy’ album and he absolutely LOVES it! In fact (and I'm not just being nice here), my wife says it is his all time favorite of the hundreds of songs he likes (he's also a big fan of Johnny Cash). Hopefully your CDs are as popular with other kids as they are with ours. His favorite song is "Shark Attack", who sings on that? We got the Sealife Songs CD and it's terrific! You guys are a hit in our household. I just wanted to send you a note to tell you that I LOVE your music! I am a pre-k teacher and I love using music in the classroom. The great thing about your music is that it is informational but at the same time the songs are easy to learn so that the children can actually learn the words and sing along! It is hard to find fun, theme-related children's music like that! Congratulations Sandi & Stevie - I love the new Sealife Songs CD, the songs, artwork, etc. - and I like Cesar the Lobster and Andrea the Crab in the Mermaid song - very, very nice! I'll play it for the rest of the sea critters at home tonight.... well, I'm about to bubble my way home to the sea cave. My son, Stephen, came home from Kindercare singing Jellyfish Flop. So I started singing it back to him, not knowing the tune except for what he taught me (he's 3). So I figured I'd better learn the tune by getting the CD. Your website is great - Stephen enjoyed looking at it with me and after I ordered the CD, wanted to immediately check the mailbox! I told him it would take a few days. I will try to get to your next performance, looks like fun! Quincy LOVES the Sealife Songs CD. For a long time he would only let us listen to the Insect Songs CD in the car. Now we can also listen to Sealife Songs. His favorite is the Dolphin song - he tells us, "That's Sandi! I like her voice!" - and he was tickled to see his picture on your website. We're looking forward to your concert season so that Quincy can see you again live. My son's and I love your songs - especially the sea life ones! We just wanted to let you know how much we enjoy listening and dancing to them. It's a great work out for me and the kids love it! We know all of them by heart. We hope to make it to a concert someday soon. (Part:1) My sons love your Insect Songs CD. They were singing them in the bath tub last night. We look forward to receiving your new CD - crossing my fingers it will be as moving as the first. We will let you know! Thanks for the tremendous work you put into your songs, we sincerely appreciate your shared gift. (Part:2) The package has arrived. Regis (6) & Willy (4) loved the Insect Songs very much, but I must confess that I love the Sealife Songs as much - or more. Willy took it to his preschool today for share day. He asked the teacher to listen to number 7 first! He loves the shark song beyond belief! Thanks a lot. I must thank you for creating such wonderful music. My two daughters dance and sing to your Sealife Songs constantly! We heard the Fishy, Fishy, Fishy song during the Philly Baseball World Series and we thought it was adorable. Went online to see who sung it. Thought the Insect CD was pretty fun too. I'm going to play them for my Mommy and Me group! We received the CDs yesterday and my daughter is already a fan! Thanks for making such wonderful music for the children. Your songs brighten our household every day! Your Sandi Sings Bedtime Favorites fit right into our Summer theme of Health & Fitness and Pajama Day (with their favorite sleepy toy)! The children loved singing all the familiar sleepy songs along with you! The 4s & 5s especially loved watching the Planetarium Show. You certainly are a Shining Star! Will you be releasing the Sandi Sings Bedtime Favorites CD soon? My twin boys love Hush Little Baby on the KIDiddles website - it puts them to sleep everytime! Yippeee! It is a beautiful song! With a magical voice! We will be anxiously awaiting the release of the CD. Until then I will walk around the office with the babies while listening to the song until they fall asleep! My daughter, Autumn, likes Baa Baa Black Sheep and she absolutely adores Twinkle Twinkle Little Star . She can listen to those songs over and over again. She even cries when we stop playing the video of Twinkle Twinkle. Sandi Sings Bedtime Favorites is the perfect CD for her to wind down for the night. I did a search for Hush Little Baby and found the KIDiddles web site. Not only did I find the lyrics I was looking for but I found a wonderful melody that almost always moves me to tears - this time it wasn't an almost. I wanted to drop you a quick note to let you know how much Archie and Quincy love the Sandi Sings Bedtime Favorites CD. They now ask to hear it when they go to bed. I asked Quincy about his favorite song and he didn't hesitate - he said he loves Little Bo Peep - and then he started singing it at the dinner table word for word. So he's really listening, even though he falls asleep to the CD :-) And so that you know, I'm listening over the baby monitor to Lavender's Blue right now. The boys insist on listening to the Bedtime CD as they drift off to sleep every night! Sandi Sings Bedtime Favorites is Beautifulllll!! I like your English Bedtime songs more than the Swiss ones. Now I can sing the songs for my baby, Ramon, and learn better English :-) Ramon likes your voices! Could you please tell me who is singing the Twinkle Twinkle Little Star song? It is such a lovely song that I would like to buy that album. I love KIDiddles more and more. The songs sung by Sandi & Stevie are awesome! I just wanted to thank you for the song on your website Hush Little Baby by Sandi & Stevie. As soon as I put the song on, my baby is almost instantly relaxed and falls asleep, usually after the third repeat. It's a godsend for me. Thank you so much! I want to let you know that Ayden loves the Sandi Sings Bedtime Favorites CD. It puts him to sleep within 10-15 minutes. I leave it playing and if he wakes up he falls right back to sleep. Every time Hush Little Baby plays he smiles because he wants me to sing to him. I'm not sure if he's laughing at my singing - I know I would. Thank you for creating this great CD and helping me with Ayden's sleep routine.